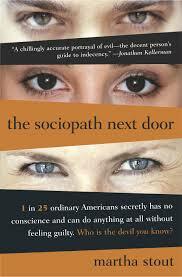 Influence is full of people behaving in weird, manipulate ways, which naturally made me start thinking of sociopaths, so I began reading Martha Strout’s The Sociopath Next Door: a book about how 4% of the population is clinically evil and the rest of us are basically alright. That’s the part of the whole sociopath thing that’s never resonated with me. I don’t like how it lets everyone else off the hook. Sociopathy may or may not be a real thing, but it seems, to me, to be unnecessary–given a strong enough desire, people can convince themselves that anything is the right thing to do. The basic behaviors are already within us: Is there anyone out there who hasn’t been cruel to someone else? Is there anyone else who hasn’t hurt someone else in order to pursue their own goals? Is there anyone who doesn’t sometimes put other people down in order to gain status? Is there anyone who doesn’t play petty status games and sometimes try to manipulate people? I mean, manipulating people and disregarding their feelings seems like a very natural part of human behavior. Look at how little kids will exaggerate their crying and pretend to be super upset, because they know that crying helps them get what they want. They don’t care that their crying is profoundly unsettling to their parents, they just want what they want, dammit! I think most people have empathy, but that it’s a pretty weak thing. It operates most strongly when dealing with people who are most similar to us, in terms of race, class, age, gender, etc. And it mostly operates when you’re physically within sight of the other person. Empathy for people you’ve never met or don’t usually encounter is oftentimes much weaker. What stops most people from engaging in criminal or anti-social behavior is not a lack of empathy, it’s just a sense of consequences. For most people, societal esteem is the most valuable thing in their lives. If you behave honorably, you tend to gain that esteem. If you behave dishonorably, you tend to lose it. But when people value something more than they value societal esteem (or when they have some weird, incorrect beliefs about the best way of getting that esteem), then they tend to behave in anti-social ways in order to get it. I agree … there are exceptions, of course, but it comes down to choice.